Sign Up for Day & Night® Dealer E-Updates Now! Day & Night® dealer e-updates deliver the latest information on new products, regulations and training directly to your inbox. 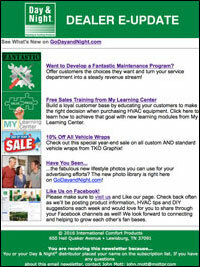 This e-newsletter is designed specifically for HVAC contractors and includes links to all the new Day & Night content you haven’t seen yet. Get notified when new stories are posted so that you don’t miss out! What types of information do Day & Night Dealer E-updates include?